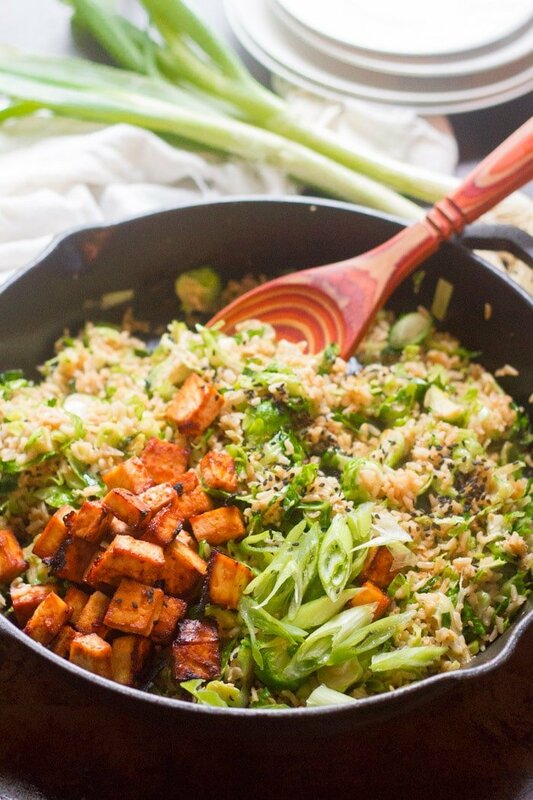 This hearty Brussels sprout fried rice has crispy fried rice and shaved Brussels sprouts with spicy chunks of baked sriracha marinated tofu. Belgian-Asian fusion at it’s best! Up next: lo mein waffles. I’m being silly. I have no idea if Brussels sprouts are actually even a Belgian thing. Maybe Brussels sprouts in Chinese food have been done before. So the initial dish I planned on using these in wouldn’t work, because it would’ve called for whole, or at least halved, Brussels sprouts, and these would have looked more like whole or half heads of cabbage in the photos. I was at least pleased to find that my giant veggies retained the texture and flavor of the normal-sized versions. If I sliced them really thin, perhaps nobody’d know they started out giant (had I not just announced it publicly on the internet). I’m kind of thankful for the interference with my initial plan, because while I can make that dish anytime, I might have never come up with this one under different conditions, and it turned out awesome. Fried rice is great. 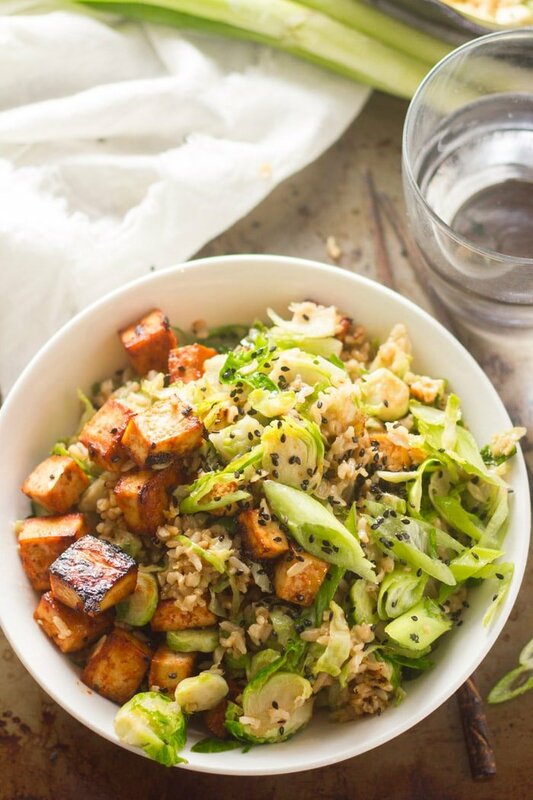 Brussels sprout fried rice with spicy tofu is better. This dish has all the flavors and textures. 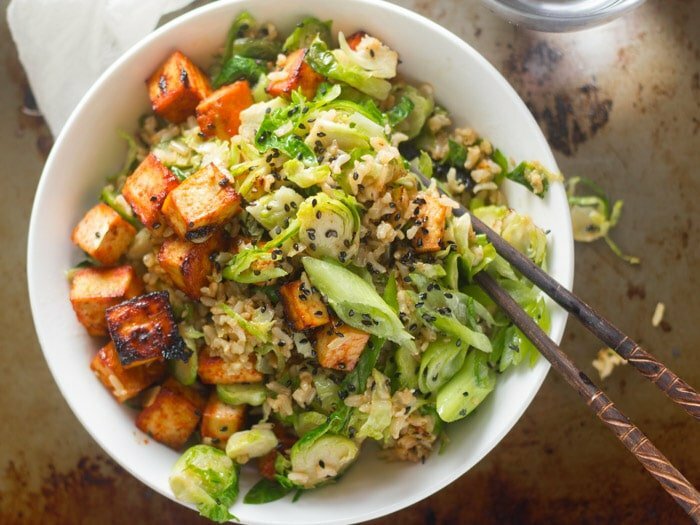 A little crunch and bitterness from the sprouts, a little sweet from maple (because I had to add maple to any Brussels sprout-centric dish), a little salty and savory from soy sauce, and then some spicy in the baked tofu, which rounds everything off beautifully. 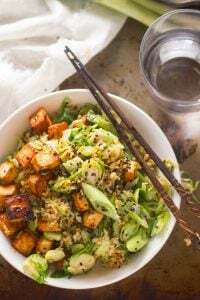 Stir the soy sauce, sriracha, vinegar, maple syrup and sesame oil together in a small bowl. Add the tofu cubes and toss to coat. 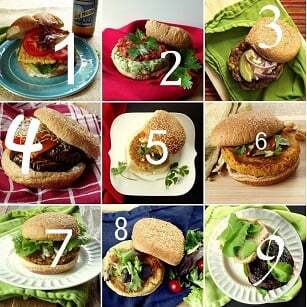 Arrange the tofu cubes in an even layer on a parchment lined baking sheet, reserving any excess marinade. Bake for 15 minutes, then gently turn and spoon or brush reserved marinade over cubes. Bake another 15 minutes, until crispy in spots. Stir the soy sauce and maple syrup together in small bowl. Set aside. Heat the oils in a large wok or skillet over high heat. Add the white parts of scallions, garlic, and ginger. Stir fry for 1 minute. Add the Brussels sprouts. Stir-fry 2 minutes more. Add the rice and soy sauce-maple syrup mixture. Continue to stir-fry until the Brussels sprouts are tender-crisp and bright green, and rice has dry, crispy spots, about 5 minutes. Remove from heat and stir in the spicy baked tofu. Divide onto plates and top with green parts of scallions and sesame seeds. Tofu can optionally be marinated for up to one day. Leftover rice works best here, as it's already a bit dried out, so it crisps up better. This was fantastic! Where is the 5 star button? We loved it. The way you thinly cut the B.S. (Brussels sprouts;) made all the difference. We all agreed that just the fried rice part, even if had no time to bake the tofu, was really delicious. A definite keeper and Pinned! Thanks again! Awesome! This was one of my favorites too! I’m always telling people who aren’t into Brussels sprouts to try slicing them thin – it’s like a whole different veggie. So glad you enjoyed this. Thanks Nina! Made this tonight and it was amazing! Can’t wait to have leftovers tomorrow! I’m so glad to hear that!! Thanks Jenny! This was amazing. I do have a question though: what is your secret to crispy rice? We made sure that it was a day old and cold, but all it did was burn to the bottom of the wok. What did we do wrong? I’m glad you enjoyed it!! I actually prefer a cast iron skillet over a wok. I know wok is supposed to be the way to go for fried rice, but if it’s well seasoned you should’t get any sticking. I also find the flat bottom of a skillet makes it easy scoop up the rice on the bottom so none of it sits there too long and burns. Aahhhh, excellent tip!! I doubled the recipe (to feed a family of 7), so figured the wok would be better suited for the volume of ingredients. But I see I might be better off using our cast iron, and cooking it in two batches instead. I did want to point out though, that while the rice didn’t crispen up as my heart had desired, the flavor was a dream. Thank you so much for taking the time to respond. Made this tonight because we had some extra Brussels sprouts I needed to get rid of. All I can say is, wow, this was incredibly delicious! I’m sending the recipe to all my vegan friends. Thank you. OMG! Just made this tonight. Outstanding!!! Can’t wait to share this recipe! Yay!! I’m glad you enjoyed it! Thanks Nancy! My husband made this for me and WOW. I have never been a fan of fried rice until I had this. We doubles it so he could take the leftovers to work but I beat him to them! We paired it with some boc choy and garlicky sautéed kale to bulk it out. So good! Yay!! I’m so glad you both enjoyed it!! Bok choy ank kale sound like delicious additions! Thanks Katherine! Aren’t they wonderful?! I hope you enjoy this! i made this at home for a friend and I and let me tell you, we licked our plates it was so good. the only thing i really added was bell peppers, mushrooms and siracha :) thank you keep it up! Those sound like delicious additions!! I’m glad you both enjoyed it!